I was Science Uplink Representative (SUR) for the last time for Sol 134 planning. I was Geology Science Theme Group Lead today for the first time in several weeks, and it ended up being a busy day. Planning went more smoothly for Sol 130, mostly because there was no uncertainty about the use of the arm. We have been waiting for the remaining soil sample in CHIMRA to be dumped before the arm instruments can be fully used again. I'm back in Flagstaff after a nice vacation with my wife, catching up on what the rovers have been doing while I was away. Again, there were no MAHLI or MARDI activities planned during my last sol (for a while) as PUL. I'm MAHLI/MARDI PUL1 again today, and again no MAHLI or MARDI activities made it into the plan. I'm back on tactical operations today, this time as MAHLI/MARDI Payload Uplink Lead. We've received much of the data acquired during the Thanksgiving holiday, including the Mastcam panorama of Yellowknife Bay, the near-term drive goal. The "touch and go" planned for Sol 102 went well , the data arriving in time for planning Sol 104. Overall, my first shift as SOWG Chair since the transition to remote operations went well. I'm back on tactical operations tomorrow as SOWG Chair, so I'm following along with Sol 102 planning to get up to speed after being away at the ChemCam team meeting. The ChemCam science team meeting went well, but we have a lot of work to do. I'm at the Applied Physics Laboratory in Maryland for a ChemCam science team meeting this week. The plan for Sol 96 was dominated by continued arm activities, with little room for "opportunistic science." There was applause in the MSL SOWG meeting room and on the phone lines as the first SAM results on solid Martian material were announced. The fifth scoop of Martian soil was successful , and Sol 94 planning was focussed on processing the sample and delivering it to CheMin. I made it home to Flagstaff last night despite being detoured by a fire that closed I-15 near Cajon Pass. I served as SOWG Chair for my last MSL tactical shift on Mars time. We squeezed a lot of good science observations into the Sol 88 plan, and I'm happy with it. The MAHLI "self portrait" of the rover that we planned on Sol 84 came out beautifully . We continue to prepare for the first delivery of a sample of Mars to SAM, the big analytical chemistry instrument on MSL. The MAHLI images of the rocks right in front of the rover came out nicely and are being processed to enable APXS placement on one or both of them. MSL operations have gone well while I was in the Bay Area: the team applauded the successful completion of CHIMRA cleaning today. I'm not at JPL for the rest of the week, but was glad to see that the ChemCam shot at the soil near MSL went as planned on Sol 74. As the MSL operations team gets more experience, we are getting more aggressive. The team applauded the first results from CheMin, which show that the instrument is working well, measuring abundances of minerals in the sandy first sample delivered to it. The third scoop of soil was successfully acquired, and partly processed by CHIMRA, dumping part of it on the observation tray . The command sequences prepared for Sol 68 were not received by MSL due to a problem with a radio transmitter at a Deep Space Network ground station. The MAHLI image of the "schmutz" in the 2nd scoop trench (at lower left in photo ) shows that it is brighter than anything else in the image, but it's still not clear what it is. 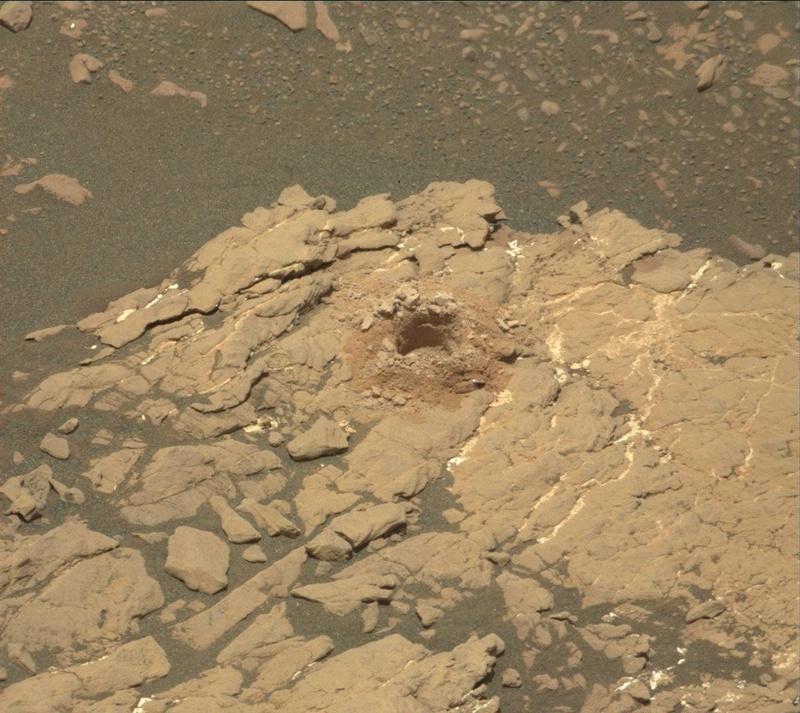 Sol 68 Update on Curiosity from USGS Scientist Ken Herkenhoff: Schmutz! Less than half of the ChemCam data acquired on Sol 66 have been received so far, but it looks like the activities we planned before the decontamination heating went well. The Sol 66 plan includes the second scooping activity on the same sandy ripple, again intended to be used to flush out the CHIMRA system, removing any remaining terrestrial contamination. There was applause again today when the successful completion of thefirst CHIMRA sieving and processing of soil wasannounced . After much analysis and discussion, the MSL project decided that the bright object on the ground is benign and that we can therefore proceed with the long-anticipated first sample manipulation activities . When I arrived at JPL Monday evening, the discussion was still centered on the bright object seen the previous sol . I took a break over the weekend to visit my family. The data from Sol 58 show that the ripple is suitable for scooping, so the Sol 59 plan includes a short rover drive to position the rover near a part of the ripple that has not been disturbed yet. The first wheel scuff went well , so we planned APXS (elemental chemistry) and MAHLI (close-up imaging) of the floor and sidewall of the scuff, as well as an undisturbed area just to the right of the scuff. I'm back at JPL, serving as SOWG Chair planning Sol 57. I haven't been following the MSL mission for the last couple days, traveling back to Flagstaff to give a talk about Mars rovers for the Flagstaff Festival of Science today at Lowell Observatory. Yet another good drive on Sol 49, leaving the rover right next to a windblown ripple (right of center) . Today I served as the leader of the Geology Science Theme Group, which was fun because I had never done it before. Sol 49 Update on Curiosity from USGS Scientist Ken Herkenhoff: 42 Meters! "Mars time" is getting closer to PDT, with first shift starting around 6 AM today. Sol 47 Update on Curiosity from USGS Scientist Ken Herkenhoff: Out of Focus! The Sol 45 rover "bump" was executed perfectly, putting the rover in position to deploy the arm instruments to the rock "Jake Matijevic" and shoot it with ChemCam's laser. The high-resolution color images of "Jake Matijevic" show that one face of the rock is clean (dust-free) enough for detailed study using the instruments on MSL's arm. Once again, the rover planners (drivers) displayed their ability to position MSL accurately, leaving the rover right where we wanted. A couple of transits of Mars' moon across the face of the sun were observedby Mastcam. The Sol 41 drive went well, but we are still on relatively featurelessterrain. Once again the drive went well and we planned another drive on Sol 41. Once again, the drive went well, and we are 20 meters closer to Glenelg,our near-term goal. The drive went as planned, and left MSL next to anice outcrop During the drive the DAN instrument monitored neutrons coming up from thesubsurface and noticed significant variations along the way. The ChemCam instrument was confirmed to be safe, but will not be used againuntil Friday to give the ChemCam team a chance to rest and regroup. The checkout of the MSL arm continues to go well: The Alpha Particle X-raySpectrometer returned its first data, of its calibration target on the sideof the rover. There were more cheers and applause when MAHLI images of the belly of therover were displayed . Over a month into the mission, there are still cheers at JPL whenfirst-time activities are completed successfully. I arrived in Pasadena at about 10 PM last night, and went straight toJPL to catch up with the MSL team and start my transition to Marstime. I was planning to stay on "Mars time" while in Flagstaff this week, but it would have meant less time with my family, so I haven't been sleeping very late. The Sol 26 drive went well, and the images taken after the drive showedsome interesting outcrops right in front of the rover. As predicted, we didn't receive enough data through MRO today to allow us to plan another drive. The highlight of the Sol 24 plan is to test some of the software that willallow the rover to avoid obstacles automatically. The rover drivers are ready to test more advanced driving techniques andsoftware, but we stayed put today to finish the last of the Mastcamcharacterization activities (the second half of the long-baseline stereoexperiment). After a day off, I'm back on shift as SOWG Chair for 3 days. Today we received data from the first ChemCam "rasters," in this case 5laser shots in a row on 3 different targets. We've started getting Mastcam characterization data on the ground, and the key focus test data have allowed us to modify the command sequences sent to acquire more characterization data with the focus quality needed to make use of them. We have received all of the full-size MARDI images of MSL's descent,and they have been combined into a video . More cheers today when the rover planners (drivers) reported that the firstMSL drive went perfectly. First the bad news: The REMS (meteorology experiment) team confirmed thattwo out of 3 wind sensors on one of the two booms on the remote sensingmast are permanently damaged and cannot be used. The MSL mission continues to go very well, with the first movement of therover wheels planned for tomorrow. Having completed the SOWG Chair shifts assigned to me over the past 4 days,I didn't have to get up before dawn this morning. Sol 14 Update on Curiosity from USGS Scientist Ken Herkenhoff: ChemCam Team Rocks! I served as SOWG Chair again today, planning Sol 13 activities for MSL. Those of us supporting MSL tactical mission operations are living on "Mars time." I served as SOWG chair again today, planning Sol 11 of the MSL mission. After a nice vacation in Flagstaff, I returned to JPL in time for Sol 10planning. Another good day on Mars: MSL's remote sensing mast was successfullydeployed, and a Navcam panorama acquired. Today I'm working as Science Uplink Representative again, planningSol 2 activities. I'm working second shift today; my tactical operations role isScience Uplink Representative. All three of the USGS scientists involved in MSL are in a large conference room in JPL building 321, along with over 400 other science team members. Update on Curiosity from USGS Scientist Ken Herkenhoff: MSL Curiosity Rover lands on Mars!